Easter is always a fun holiday for our family. We delight in egg hunts, chocolate bunnies, and gift baskets. But we also celebrate it by getting together with our extended family, and embracing the true meaning of the holiday. It’s always nice when we can get together as a family, and spend time laughing and reconnecting with each other. This year Arianna was really involved in picking her Easter outfit. I gave her a few options to choose from, but she picked out this Children’s Place Fit n Flare Dress herself. (Which worked out great because it was secretly my favorite dress too!) We paired it with a denim jacket to make it a little more casual, and a cute jelly duffle bag, which she picked out too. I'm loving that she's turning into a little fashionista and styling outfits all by herself! I can't wait to see how her personal style will progress in the next few years. Arianna looks adorable! Madison always wants to have a say in what she wears sometimes it works out well other times I just have to let her go with it! 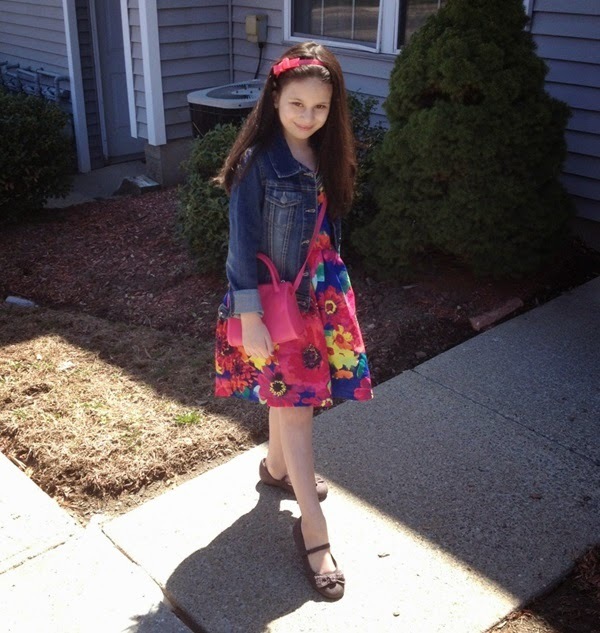 :) For Easter I had her outfit picked out but she made a few changes, like her shoes and leggings were her idea. That's awesome! A girl with a her own sense of style - I like that. Hope you had a great Easter.